The Green Bay Packers hosted the Indianapolis Colts on Sunday at Lambeau Field; however, that was the least of the Colts’ problems. Combine Peyton Manning’s – and the team’s – poor performance along with a resurgence of the Packers’ defense and all of that added up to Green Bay slamming Indianapolis 34-17. 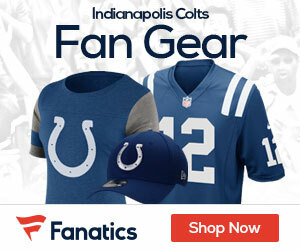 While the Packers got gritty efforts from quarterback Aaron Rodgers and running back Ryan Grant, it was their defense that was their saving grace as they forced the Colts to turn the ball over twice and also made them penalty-prone, as well (Indianapolis committed 12 penalties for 110 yards). The Colts, on the other hand, just had a poor overall team effort – without a doubt Manning being the biggest culprit – as interceptions, along with numerous penalties (many on defense) – doomed the Colts almost from the start of the game. But the Green Bay defense played like the Packers defense of old as they returned two of Manning’s interceptions for touchdowns – one each by safeties Nick Collins and Aaron Rouse. 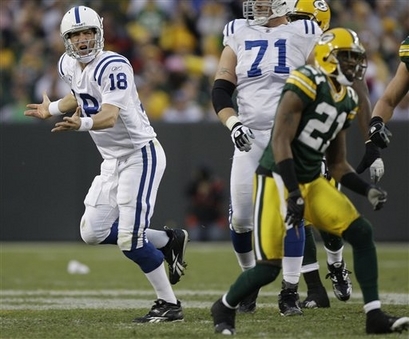 Manning probably had his worst game of the 2008 season thus far, going 21-for-42 for 229 yards and 2 INT’s while Rodgers gutted out a decent effort, going 21-of-28 for 186 yards and a TD. Dominic Rhodes led the Colts rushing attack with 73 yards on 20 carries and 2 scores while Grant ran for 105 yards and a TD. Tight end Dallas Clark led all Colts receivers with 81 yards on 8 receptions while Anthony Gonzalez added 5 catches for 72 yards. The Packers receiving corps was led by RB Brandon Jackson with 6 receptions for 37 yards while TE Donald Lee caught a pair for 23 yards and a TD. Green Bay (4-3) will enjoy a bye week before they travel to Nashville to take on the Tennessee Titans on november 2 while Indianapolis (3-3), coincidentally or not, also go to Nashville to take on the Titans next Monday (October 27) night.